I don’t know what has gotten me into this scary story kick. Honestly, it seems to have come out of nowhere! Summer is approaching quickly, people are still striving to work off that holiday weight for their bikinis and trunks, yet here I am ready for freakin’ halloween! Geez… there is something wrong with this guy. Luckily, Aaron isn’t weirded out by me, but a weirdo himself. So, I’m going to ride this out. A couple days ago I was reminded of a story I once heard. Mind you, a true story. One that freaked me out when I first read it. And it has to do with none other than the most famous ship ever to have set off, marking one the greatest tragedies in human history. I’ve always had a strange obsession with the Titanic (even before the 1999 blockbuster hit the screen). The earliest memory I have is in fourth grade when I read a book about it for the first time. We had to do a book report. While my peers read books like Goosebumps, Animorphs and Wish Bone (Don’t hate. This dog taught me so much), I did my report on the Titanic. Talk about being a weirdo! The RMS Titanic began its voyage on April 10, 1912 in which it would cross the North Atlantic Ocean to New York City. Sadly, it would never reach its destination. About 2,224 people were aboard the ship, crew included, but only 705 survived. 1) The RMS Titanic cost $7.5 million dollars to build (400 million today). 2) The price for one first class ticket was $4,700 which would be around $50,000 when compared in today’s world. 3) The Titanic would not have sunk if it had hit the iceberg straight on. 5) The Titanic was discovered 74 years after the fatal wreckage. Now to the bizarre and incredibly shocking. 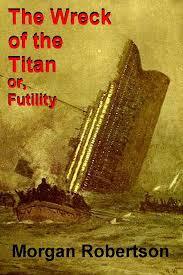 Yes, we know much of the RSM Titanic, but little do we know that 14 years BEFORE the sinking of the Titanic, author Morgan Robertson wrote a novel titled Futility in 1898. The storyline is about a ship called “Titan” that hit (you guessed it) an iceberg in the North Atlantic Ocean. How eerie is that?! Now, the storyline does have its own unique adventure, but there are many and I mean MANY similarities to the true story. Some include the ships sinking in April, speed, and the lack of enough lifeboats for all onboard. Both the fictional Titan and the Titanic were described as “practically unsinkable.” The number onboard Titan was roughly 300 passengers (2500) more than the true number on the Titanic. Lastly, both ships were said to be one of man’s greatest achievements to date. I don’t know about you, but I find this story incredibly fascinating. I’ve read many stories describing authors writing fictional stories that have later become true. Are authors like mediums and psychics, pulling from something greater than themselves to predict the future? Or was Morgan Robertson’s Futility only a curious coincidence? I for one don’t believe in coincidence, but believe Mr. Robertson was in fact seeing the future. What does everyone else think? Are you as freaked out about this story as I am? If you missed it, check out my novel The Blackwell Family Secret: The Guardians of Sin, published by Dragonwell Publishing December 4, 2014. Synopsis: Seven deadly sins have been unleashed, and the only one who can defeat them is the boy who set them free. Nicholas Blackwell has no idea he is supposed to fulfill a destiny. All he knows is that he draws trouble like a magnet. Orphaned at seven when two demonic men killed his parents, he copes with the strict rules of his new home, St. Christopher’s academy, unaware that he has been the real target for the killers and that his guardian angel has saved him in the nick of time. And now, his problems are only beginning when a mysterious serpent lures him into the woods and tricks him into a demonic ritual that will unleash the Seven Deadly Sins to destroy the humankind. Nicholas has no choice but to correct his mistake–or die trying. Aided by Amy, a shy but determined girl who seems to know more about his task than she should, Nicholas’s quest is to travel into the City of Demonio and defeat the Seven Guardians of Sin. To succeed, he must confront demons, monsters, and lost souls, learn the mysteries of the Chapel of Dreams, discover the true meaning of friendship and love, and face the darkest secret of all: the Blackwell Family Secret. 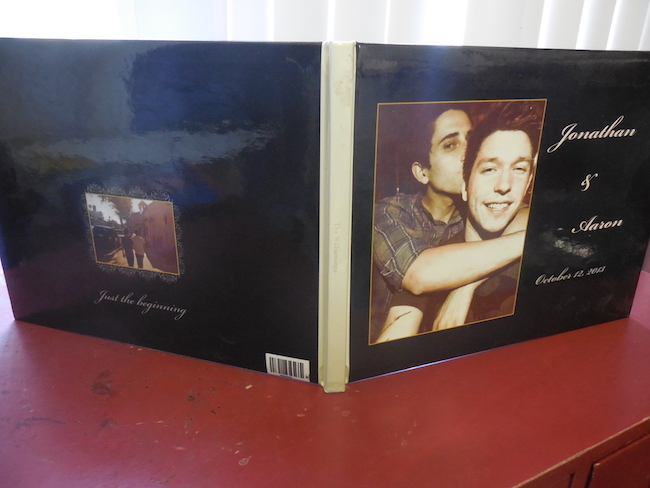 Photo albums are very important to us. Unfortunately, they tend not to be created at all if we don’t immediately start one the moment we return from a trip. Let’s face it, they can be a bit of a pain. You have to make your way to the store to get the photos developed, purchase an album and then put them all together. If you’re anything like Jonathan, you end up ripping pictures, breaking the album and cutting yourself several times in the process. 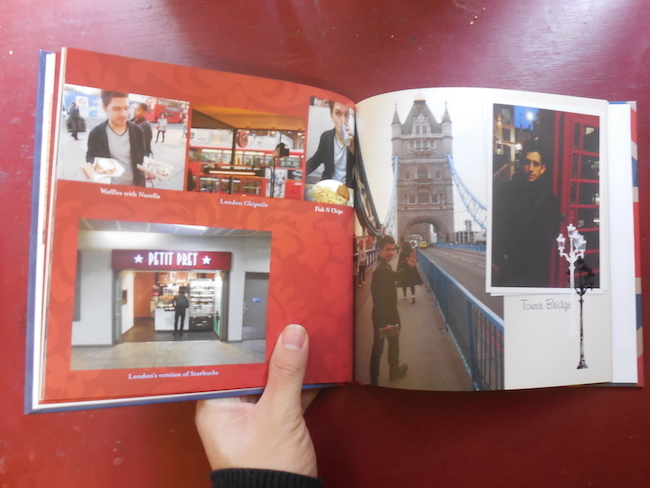 And if you try to make a scrapbook….wooo! Even more work. Luckily, we discovered Shutterfly.com. With this website you can upload your pictures into the website, design your own album and have it shipped to you in a professionally bound book. It’s not too expensive, very fun to make and so easy, a child can do it. The great thing about Shutterfly.com is that you have all your pictures saved to your account. Incase there is a fire (knock on wood) and all your pictures get destroyed, you have them all safe online. I think this is a great tradition for people to start doing. It has become one for us. 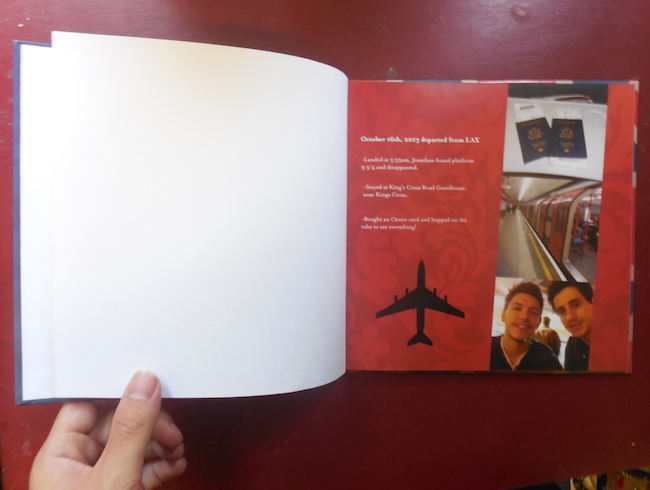 Starting with our wedding guest book, we try to make an album for any and every special event. From birthdays to vacations we use Shutterfly for it all. We were actually inspired by my sister-in-law who made an album for our nephew’s first birthday. If you like arts and crafts, advice on diets, check out her blog http://www.chaosandlove.com. (She’s been blogging for a while and has some great things to offer). We want to continue the tradition for when we have our own kids. We plan (hopefully stick to it) but use Shutterfly to create albums for our kids birthday. We thought it would be fun to make an album of their year. Every birthday album would consist of pictures of when the child was that age. By their eighteenth birthday, they could look back at an entire book series of their life. How cool would that be?! Funny/embarrassing story. 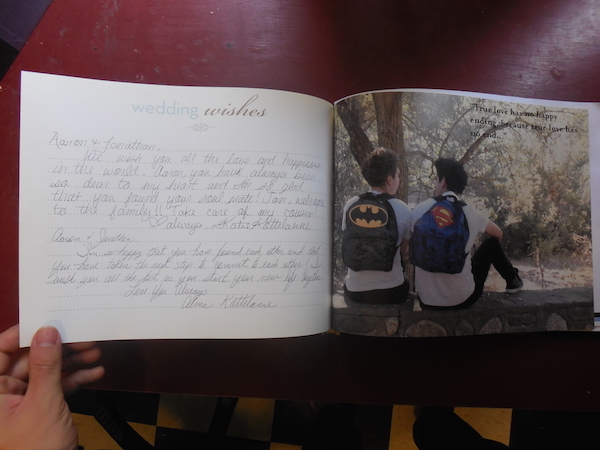 When we built our wedding guest signature book, we accidentally forgot to edit the spine. (you can customize EVERYTHING from the cover, to page length, etc.) 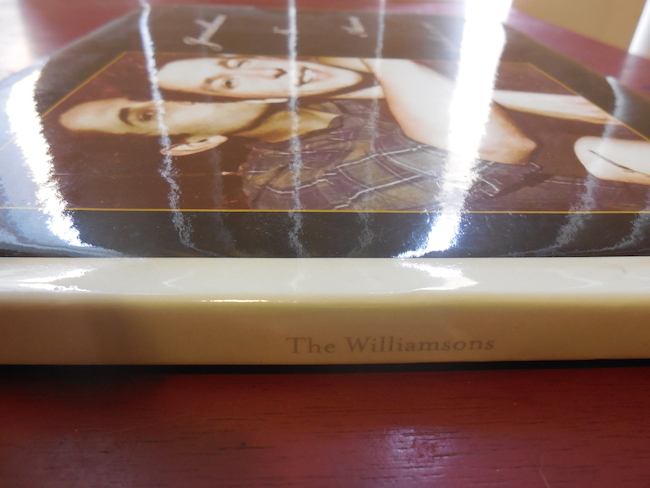 So we are forever immortalized as “The Williamsons”. haha. Just a friendly tip to pay attention to detail. Alright! We’ve gotten to the halfway point. I give this one the thumbs up!! Again, author Brandon Mull has expanded his world of Fablehaven, creeping you closer to the finale. The basic concept of Grip of the Shadow Plague is that someone has unleashed a plague into Fablehaven, turning beings of light into beings of dark. The reason for this is to destroy Fablehaven exactly how other magical preserves have by the Society of the Evening Star. Also, a few characters go off to Lost Mesa in Arizona which was fun to see a different preserve rather than the wonderful one we know and love. Lost Mesa was interesting. (They’re zombies here!). Something that has bothered me so far through the series is Mull’s concept of “demons.” They live amongst magical creatures, some of which, in Fablehaven. However, I want to know more about them. Are demons just magical creatures that turn evil? I’m not sure. Don’t worry though. It doesn’t stray the focus, it just leaves you speculating. Like I’ve said about the first two books in the series, Grip of the Shadow Plague is a really fun, enjoyable book and can capture an audience of both children and adults, male or female. For anyone who loves fantasy/adventure, this is for you. Brandon Mull no longer lives on the side of a mountain above a prison. He now resides in a happy little valley near the mouth of a canyon with his wife and three children. Since the arrival of his new daughter, he is more the golem of the household than ever, following whatever orders trickle down the chain of command. Brandon is the author of the New York Times bestselling Fablehaven books and The Candy Shop War.